To jump immediately to the air monitoring map below, click here. Effective, Monday, July 9, 2018, the air monitoring program has been updated to reflect the suspension of the remediation. An updated map for the six locations where samples will continue to be collected is shown below. These changes have been approved by EPA. All activities related to the remedy have been suspended. Air sampling results during the suspension of remediation are being collected from City Place, iPark, and the site perimeter fence line. Samples are collected for off-site laboratory analysis of nine VOCs that are present in the soil at the Quanta site. The results are compared with Risk Screening Levels (RSLs). More about RSLs here. Air samples for VOC analysis include six locations as shown on the map below. The locations are the perimeter (FD-02), City Place (two locations), and iPark (three locations). Samples are collected for 24 hours. There is no real-time monitoring for total VOCs because there is no construction activity; dust monitoring will continue. With EPA approval, on August 13, 2018, the sampling frequency was changed to 3 days per week, after 3.5 consecutive weeks of results consistent with what would be expected of background concentrations. Should there be a detection that may be attributable to Quanta, the frequency will be increased accordingly. There may be adjustments to this program based on sampling results. Any updates to the sampling plan will be posted on this website. 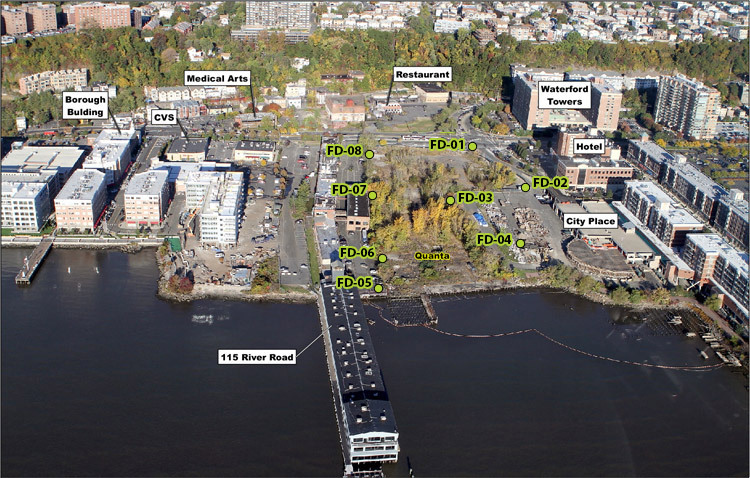 A separate Air Monitoring Plan was developed for the demolition of 115 River Road. More information can be found here. The Quanta property was the home of a roofing tar plant for more than 100 years. Roofing tar was produced from coal tar. Coal/roofing tar has a distinct odor similar to asphalt or mothballs. Extensive efforts are being taken to minimize odors from the coal/roofing tar that remains in the Quanta site soil. However, odors will likely occur when soil containing coal/roofing tar is first uncovered. Additionally, because residual odors may linger in the air after the work day, you may notice a coal/roofing tar smell after construction workers have left the site. How long the odors persist depends on a number of factors, including the intensity of the odor, the length of time the contaminated soil was exposed, and environmental factors such as wind direction, wind speed, and air temperature. 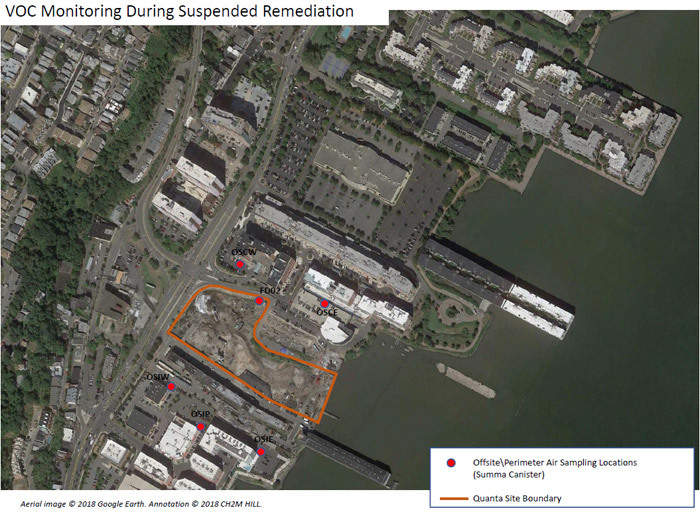 EPA and NJDEP have been working with Honeywell to address odors that are associated with coal tar and creosote found at the Quanta site. Coal tar/creosote on the site is a viscous liquid located a foot or more beneath the ground surface. It has a low odor threshold, which means you can detect this odor even at very low concentrations. The odors can be offensive to some people. However, presence of the odor does not necessarily indicate a potential effect on public health. The human nose can detect coal/roofing tar odors at levels below those that indicate a health risk. For more information about environmental odors, please see this U.S. government fact sheet. Dust monitoring for demolition began on 9/12/2018. Results can be found here. Past VOC and dust data during construction and pre-demolition activities (prior to 9/12/2018) can be found on the interactive map below. Data provided in hyperlinks above. To view the data collected, select a date from the drop-down list and click "Change" (dates not shown in the list have no data available). Then, move your cursor over a monitor icon to view the data. Click "View wind direction & speed" to see a graph of the wind conditions for the selected date. View wind direction & speed gathered on April 18, 2019 from monitor FD-03. View wind direction & speed gathered on April 18, 2019 from monitor FD-08. Locations of Mobile Devices (MD) are adjusted daily based on field operations, wind direction, and sensitive receptors.